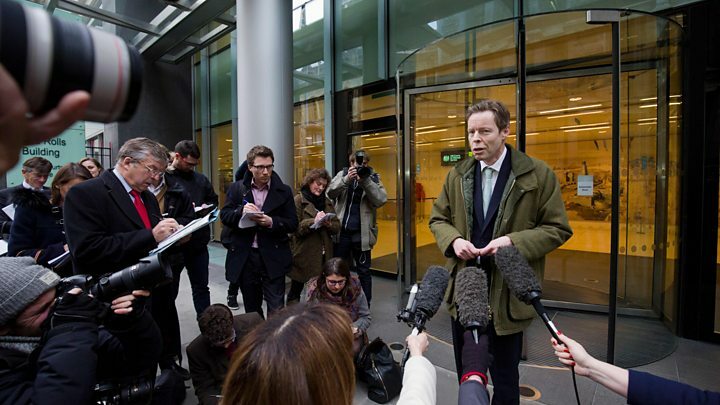 Media captionLord Bingham, Lord Lucan's son: "I've heard bizarre theories about my father"
Lord Lucan is now presumed to be dead, a High Court judge has ruled. A death certificate has been issued 42 years after the peer vanished when his children's nanny Sandra Rivett was bludgeoned to death in London. He was declared dead in 1999, despite dozens of unverified sightings, but the new ruling gives his son the right to inherit the family title. His son, Lord Bingham, said: "I am very happy with the judgment of the court in this matter." Speaking outside the court, he added: "It has been a very long time coming." Ms Rivett's son, 49-year-old Neil Berriman said: "I think [Lucan is] dead. It is fantastic and I am very pleased for [Bingham]." Lucan disappeared the night Ms Rivett was murdered at 46 Lower Belgrave St, Belgravia, on 7 November, 1974. He drove to a friend's house in East Sussex in a borrowed car, which was later found abandoned in Newhaven with bloodstains inside. The mystery of his whereabouts excited decades of speculation. Lady Lucan said at the time of the killing that her husband admitted committing the crime, although he said it was a mistake. It has been reported that she believes Lucan jumped to his death from a ferry leaving Newhaven. The first reported sightings of Lucan occurred soon after the murder. In January 1975 he was supposedly spotted in Melbourne, Australia, and five months later he was apparently spotted in France. Police in Cape Town went so far as to check fingerprints on a beer glass, reputedly held by the peer. In 2012, Lucan's brother Hugh Bingham said he was "sure" the missing peer fled to Africa following the nanny's murder. But he then said he was unsure if his sibling was alive or dead. The author of one book claimed an intruder murdered the nanny and attacked Lady Lucan. In another book, a former senior Scotland Yard detective said that Lucan fled to Goa where he lived a hippy lifestyle as Barry Halpin until his death in 1996. Other "sightings" of Lucan located him in an ex-Nazi colony in Paraguay, a sheep station in the Australian outback, backpacking on Mount Etna and working as a waiter in San Francisco. Today a new Lord Lucan left the High Court. George Bingham had won his fight to have a death certificate issued for his father allowing him to use the family name. He now becomes Lord Lucan in addition to the eighth Earl of Lucan. He had always said this legal process had been about gaining "closure." Speaking outside the High Court he accepted that some would view the title Lord Lucan as a tainted title but it was his family name and he wanted the right to use it. Next to him in court sat Neil Berriman, the son of Sandra Rivett, the nanny brutally killed in the Lucan family home in November 1974. The pair have struck up a friendship based on their shared history. Although Neil Berriman did not object to today's legal ruling, he said he still feels strongly that his mother is the forgotten victim who is still awaiting justice. Outside the court, George Bingham - now the 8th Earl - said: "I've heard the most bizarre range of theories, some of them reasonably tasteless. "My own personal view, and it was one I took as an eight-year-old boy, is that he has unfortunately been dead since that time. "In the circumstances I would think it possible that he saw his life at an end, regardless of guilt or otherwise, being dragged through the courts and the media would have destroyed his personal life, his career and the chances of getting the custody of his children back. And that may well have pushed a man to end his own life, but I have no idea." 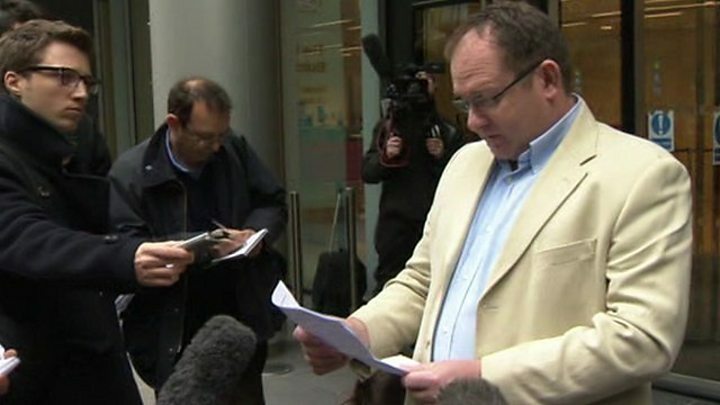 Also speaking outside the court, Mr Berriman said the case remained shrouded in mystery. "I personally, along with other people I worked with on this case, know that the convenient drowning, shooting that night, of Lord Lucan is not true. "Maybe the police know more than they let on. But at the end we have to get to the truth and justice for Sandra. A horrible death, a young woman beaten - my mother. "There is no getting away from the fact that, whatever happened that night, Lord Lucan is guilty of something in my eyes." 2014 The Presumption of Death Act enables Lord Bingham to apply to have Lucan declared dead so he can inherit the family title.